This is the thread to enjoy the reports, images and videos of another world that 「Yuuji」 has uploaded. Is it really another world? How did he fabricate it? This is the thread to verify this. Pioneering, studying and training, Yuuji passed the winter days without anything worthy of noting. Since it is spring, something surely will happen! The next thread will be set up by the NEET who step over the 900th post. It’s serious, it’s freakin’ serious. What has made thou so flustered, lad? This flow of events, the third time in one year! Isn’t it Hachigoro and Zenigata Heiji? So, what happened Yuuji-san, who didn’t go to the city even though it is in another world? Mr. Police Officer, here’s a job for you! By the way, what kind of being is a beastkin? Human + Kemomimi (animal ear)? Whole body covered with fur? The peddler recommended a dog beast-kin that has good loyalty. As expected, it’s better to construct a house outside, right? T-to sudden live under the same roof, it’s a bit “that”, don’t you guys agree? Perhaps, the slavery system is closer to that of Ancient Rome’s? Sakura-chan is also watching this thread, you know! Yuuji, you are overwhelmingly GUILTY! 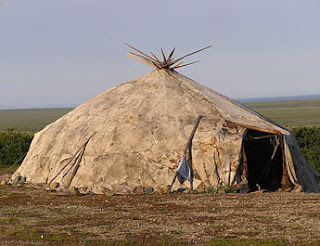 Why don’t you make the Yaranga of the Chukchi People? …… But, there are people who are looking forward to the ‘videos’, right? As always, an unknown knowledge! and then assemble it again outside? I-I don’t need to see the video or the like! So the shed… For now, it’s something like a tent? As expected, it should be outside, right? What are you guys’ advice? Isn’t there is something, you know… improper? So he must not have realized it! He left college and became a hiki-NEET for 10 years, after all! I am a NEET, but even I know that it is improper! On the priority? Is there something improper? If I have to say, perhaps about the livestock? Kotarou will work as a herding dog! You are the scum of society! Please learn from, this Yuuji! There are better ways to refer to them, right!? Yuuji will get a lecture from Sakura. As it is oftentimes happens, imouto will prevent the MC (pseudo-one since Kotarou is the MC) from getting a harem. Zenigata Heiji (銭形 平次 Zenigata Heiji) is a Japanese fictional character created by novelist Nomura Kodou, the hero of a series of many Japanese novels, films and TV programmes set in the Edo period (1603-1868) of Japanese history. Can mean blushing or acting like “villain” (in traditional Kabuki theater, the villain role wear red mask. whats wrong with the priority order? Gasp...you like them....OFFIC....just kidding. He mention slave buying first. Maybe. You would notice he mention slave buying first despite having a lot that he have to finish first. I also don't really see an issue with the order. The point of buying the slave is to increase the rate of clearing the land for farming. He can't register as a Pioneer Citizen without more having more land cleared and planted and the slave will speed that process up. He can't get into the city without having that done first as well. He will need to buy a female slave as I can't imagine Yuugi having enough of a spine to order a large male dog beastkin around. He could probably manage with a female dog beastkin, but it is more likely that the MC (Kotaro) will be the one controlling the slave. Only issue with buying the slave first is the problem of where they are going to live. All of the other points he listed will be sped up by the presence of a slave or two. @anon he is at the planning stage and he asked first about the slave buying while there are some things that is more pressing.This indicate that he hold the slave buying as primary thus it is improper. Cont. Whether or not he would buy the slave first is not the issue. The issue is he mention about it first and with such impact while when he mention other stuffs it is less impact and he shown the video as if it is less important. They thought he was referring to the slave as a livestock so they got pissed. This series is great. Honestly I don't know what is wrong with the order either ��. Also I'm curious nobody pointed out that the lady MC (though it's actually a dog) can beat two orcs without trouble and the adventurers, although had it under control, struggled a little bit. Thanks for the translation �� ✌.